This week, a visit by Bob “Dr. 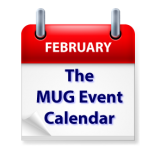 Mac” LeVitus to a Texas group is at the top of the list for The MUG Event Calendar. A discussion of 1Password at a Colorado group, tracking simple things with simple spreadsheets at a Texas group, and a review of social apps are also on the list of events. AppleWichita – Social Apps such as Twitter, Instagram, and Snapchat. Tuscon Macintosh Users Group – Election of Officers; Tech Update; Default Folder X; Apple Security Update; "Why Apple Watch?"